THIS WEEK’S OTHER FEATURED BOOK, “RELEASED FROM THE SHADOWS,” BY DONNA CANTOR, CAN BE FOUND BY SCROLLING DOWN BELOW THIS POST, ALONG WITH THE “FIRST TUESDAY REPLAY.” OR, YOU CAN CLICK ON DONNA’S NAME ON OUR AUTHOR PAGE. SUMMARY: Apology to a Whale investigates the question: What is it about our culture that is killing life on Earth? The answer will be as big a surprise to the reader as it was to the writer discovering it. THE BACK STORY: After I published Devil’s Tango: How I learned the Fukushima Step by Step on the first anniversary of the triple meltdown in Japan, I found I wasn’t completely “written out.” The book made me re-discover how much I loved our green and blue planet, and how I marveled at all the unbelievably varied and resourceful forms of life here in this magic garden. I puzzled what lies at the root of ecological destruction. WHY THIS TITLE? : Humans, who have overmultiplied and pushed all other species towards extinction, need to apologize to all life (including human life), not so much to ask for forgiveness, or even trying to explain, but as an act of reverence for all beings great and small. WHY SOMEONE WOULD WANT TO READ IT: Anyone who loves Earth, who reveres all living things, who wants to feel inspired, and who has ever asked the question: what is it about this culture that is killing life on our planet? 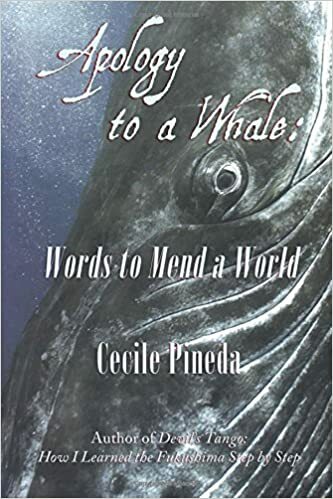 AUTHOR PROFILE: Cecile Pineda has nine books in print. Known primarily for her fiction, she is the winner of the California Commonwealth Club Gold medal, and a nominee for the 2014 Neustadt International Prize. WHERE ELSE TO BUY IT: Amazon. PRICE: $16.95 / also available for Kindle and Nook.